It was a pleasure to talk to the rising Asian-American movie star JuJu Chan Yuk-wan on the latest episode of the Kung Fu Movie Guide Podcast. 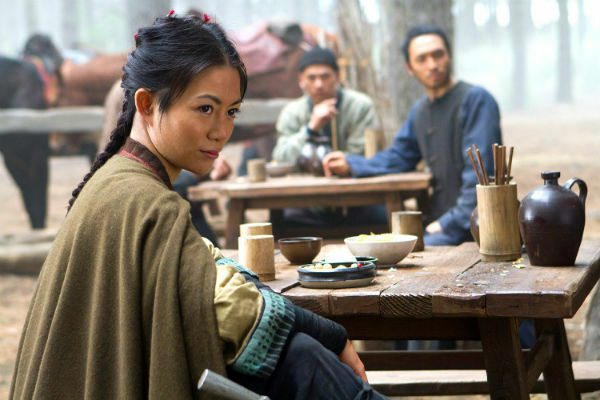 JuJu was born in Hong Kong and raised in America where she has enjoyed prominent roles in movies like the Netflix-produced sequel Crouching Tiger, Hidden Dragon: Sword of Destiny (2016) – directed by kung fu movie legend Yuen Woo-ping, and starring Donnie Yen and Michelle Yeoh – plus roles in films like Fist of the Dragon (2014) for Roger Corman and Jesse Johnson’s Savage Dog (2017), starring Scott Adkins, Cung Le and Marko Zaror. JuJu continues to work consistently across the American and Chinese film markets, appearing in eight films in 2016 alone, including Fruit Chan’s The Invincible Dragon, which co-stars Max Zhang and the UFC fighter Anderson Silva. We discuss JuJu’s multifaceted career, which has seen her graduate from film school in New York to winning beauty pageants around the world, followed by a star-making turn in a popular Hong Kong reality show which made her a household name. She has written books and released an album, as well as continued to train in her main passion: the martial arts. JuJu has picked up medals in taekwondo and Muay Thai kickboxing competitions, and she regularly performs at events as well as in the movies, where she has been described as a ‘female Bruce Lee’. She has recently become the spokesperson for a smartphone fitness app called Move It. If you want to purchase the app, you can get a 10 per cent discount when you enter this offer code: juju2017. On this episode of the podcast, you will hear us discuss many topics including Asian actresses in Hollywood, beauty pageants, how to keep fit, and doing karaoke with Michelle Yeoh. Enjoy! Scott Adkins and JuJu Chan in Savage Dog (2017). A publicity shot of JuJu Chan. She would make a good Chun Li in the Street Fighter World Warrior TV series.